Coffee Affair, in London’s Queenstown Road Station on the line into Waterloo, was a chance discovery. I’ve been through the station many, many times, but I’m not sure I’ve even stopped there before now. Then, when the shortlists for the Coffee Spot Awards 2013 came out, I got told off on Twitter for not including Coffee Affair in the Best Coffee Spot near a Railway Station category. Intrigued, I made it a New Year’s resolution to investigate and, having done so, I have to say that the loss is all mine. Mags and Michael, the couple behind Coffee Affair, have been at Queenstown Road since 2006, first in a Piaggio Ape and now in their current location, the old ticket office. That’s seven years of coffee goodness I’ve missed out on! If, like me, you’ve not been before, what you’re missing is a small, friendly coffee shop in a lovely space, with excellent coffee that’s as good as you’ll find anywhere. There’s the usual espresso-based range or you can have filter coffee. This is either freshly made on the bulk-brewer or, if you come after the morning rush, Mags or Michael will make a V60 pour-over just for you. January 2015: For the foreseeable future, Coffee Affair will be open until four o’clock on Saturdays. May 2018: It is with great sadness that I have to report that Coffee Affair has closed, Mags and Michael having decided that they need a sabatical. I wish them both well in whatever the future brings them. I’m rather annoyed at myself for not having discovered Coffee Affair before now. It is, after all, exactly the sort of place that I set the Coffee Spot up to promote. Run by the delightful Mags and Michael, it’s an unpretentious, small, friendly neighbourhood coffee shop in a station that happens (and not by accident) to serve some of the best coffee around. However, it doesn’t stop there. There’s an excellent range of cakes and pastries, plus, come lunchtime (12:00 – 14:30, not Saturday), handmade sandwiches and homemade soup. With an impressive commitment to high-quality ingredients, all the meat is free-range, the fish sustainably sourced and the rest of the food either free-range or organic. Coffee Affair also sources as directly as possible, often buying straight from the farmer. Coffee Affair has been in Queenstown Road since 2006, moving into the old ticket office in 2010. It’s just before the ticket barriers (coming in off the street) so you can pop in without having to buy a ticket! Indeed, Coffee Affair is as much a neighbourhood coffee shop as it is a caffeine stop for morning commuters. The ticket office reflects the station’s Victorian roots, with high ceilings and a wonderful feeling of space. Long and thin, the counter is right in front of you as you enter from the booking hall, with the rest of the shop running away to your right. It’s not huge, but there are a pair of round tables at the back and a few stools you can perch on. Behind you as you come in is a second counter with an impressive array of water boilers, grinders, scales, pour-over filters and siphons. Or, as my non-coffee-drinking friend described it, “a chemistry set”. The espresso machine is on the main counter, next to the cakes, which greet you as you come in. Coffee Affair’s house-blend is from Union Hand-roasted while filter and decaf are from various roasters on a regularly-rotating basis. 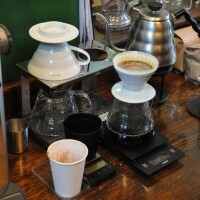 During my visit, there was a Square Mile decaf and a Yukro from Workshop on filter. First thing in the morning, the filter coffee is bulk-brewed for ease of serving. Mags and Michael know their customers so well that they often make exactly the right amount, so little goes to waste! This means that customers heading for their morning train get freshly-made filter coffee without having to wait. After that, it’s over to the trusty V60 (Michael reckons the bulk-brewer is almost as good as a well-made pour-over). If you like that sort of thing, you can sit at the back and watch it being made (or take endless photographs!). I had a very fine cortado on my first visit (my non-coffee-drinking friend had hot chocolate and was very taken by the handle-less mug). On my return, Mags made me a V60 which was equally as good. The Yukro was very much to my tastes, with nothing too challenging to daunt my palette early in the morning. I rounded things off with a lovely cheddar and chutney sandwich, handmade by Mags. There’s a choice of white, walnut or rye bread and the fillings are really generous: mine was stuffed with tomato and lettuce as well as the advertised cheddar and chutney. The great thing was that none of the individual elements over-powered the others. This entry was posted in Cake, Closed, Coffee Shops, Laptop Friendly, Lunch, Sandwiches, South West London, Stations and tagged Union by Brian Williams. Bookmark the permalink. Just as I think your photography can’t get any better… it does! The shots of the cortado and the roll especially.